Ceuta is a Spanish town in the north of Africa, an example of coexistence of different cultures. In Ceuta we can highlight its wonderful climate and low prices, so if you like shopping it is a recommended visit. In addition, the tour includes Ceuta´s most important sights, so we're not leaving without knowing the city´s heritage. Getting to Ceuta from Malaga is easy if we choose to book a tour or a minibus. The guided tour includes transportation by ferry (lasting approximately 35 minutes) and is a highly recommended option with a great quality / price ratio. The price of the excursion to Ceuta is 62 € and its duration is 1 day, with weekly departures from Malaga on Thursdays throughout the year. 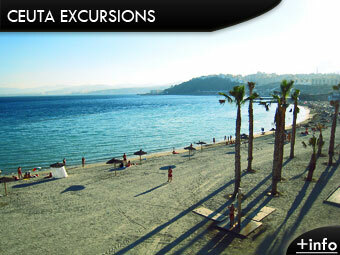 What is included in the excursion to Ceuta? Among many other things are include the ferry and free time for shopping. You will visit the Royal Walls, the navigable canal of San Felipe, the historical and commercial centre of Ceuta and the Mediterranean Marine Park, which entrance is not included in the price. The visit will conclude at the viewpoints of Mount Hacho with spectacular views of the Strait of Gibraltar and the city. The tour includes a European lunch (excluding drinks) at Club Nautico Caballa or Restaurant Varadero. A passport or identity card is mandatory for your visit to Ceuta. If you plan to go during the winter do not forget to bring warm clothing as it can be cold in Ceuta due to the proximity of the Atlantic Ocean. During the summer take in consideration the higher temperatures, bring comfortable and light clothes. If you are or think you are sensitive to sea sickness, do not forget to take some pills for the trip by ferry. Transfer Malaga airport to Ceuta: For you, your family or a group of people. Check prices and different options from Malaga airport.